ANGLING – it’s the ultimate country pursuit, isn’t it? Just you and your rod versus the fish and the water. Whether you’re standing on a river bank, up to your chest in waders or bobbing about on a boat, there’s no better way to commune with nature. The true angler will tell you catching fish is just a bonus – the real joy is being in the great outdoors under the great canopy of the sky with the breeze caressing your cheek, the sun warming your head or the rain pattering your umbrella. Clearly, this bucolic vision is not one that’s shared by the anglers who spend their Sundays at Stoneyford Reservoir – or most of them, anyway. Squinter’s taking the dog for a walk along the Huntshill Road, which skirts the eastern edge of the reservoir and parked along the narrow lane are dozens of cars and vans which have brought the fishermen (not a female in sight) to this lovely corner of County Antrim. Except the vehicles aren’t just being used for transportation – they’re providing home comforts too. Around two thirds of the anglers are in their vehicles, even though it’s a perfectly dry and even balmy early autumn afternoon. Yards from the drivers’ windows, the fishing rods are propped up on rests while their owners read the Sunday World, smoke, eat sandwiches, listen to the radio and occasionally even doze. A minority is fishing the way you’d expect people to fish – standing or sitting at the water’s edge watching the line or fussing over a hook. The first question to be asked is, can sitting in your car be called fishing, even if you have a line in the water a few feet from your window? If you want to listen to the radio or read the papers on a Sunday, surely you can do that in the house without taking up a spot that would be better used by a real angler. And another thing, if you’ve nodded off, or if you have your face in a ham and cheese baguette, how are you supposed to know whether there’s a fish on your line? Do such people even care? Not that car-fishing was the only thing that caught Squinter’s attention as he continued on his way. What’s also remarkable is the amount of litter being dumped at fishing spots by anglers. Cigarette boxes, plastic bags, sandwich cartons, plastic bottles – it’s clear that the old adage of taking home anything you take to the countryside with you has not filtered through to significant numbers of the local angling fraternity. Which is strange, because Squinter always had this vague notion that people who like fishing like nature. Sure, the odd animal rights activist at the extreme end of the spectrum might argue that fishermen are on a par with the Yorkshire Ripper, but Squinter always reckoned that fishermen were salt-of-the-earth types with a respect for both their quarry and the environment. 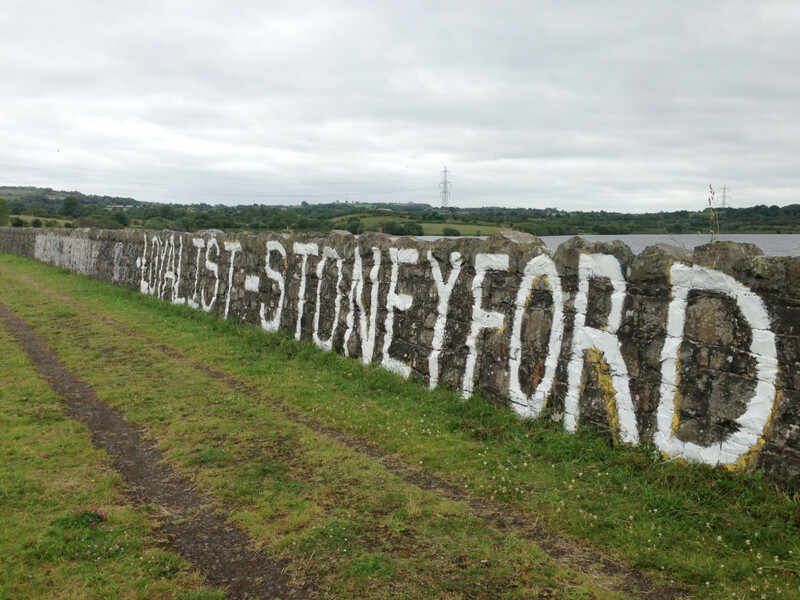 A dander round Stoneyford Reservoir quickly disabused him of that notion – at times it looked like the Lisburn Road at teatime on the Twelfth. It’s not great, all of this, is it? Against such a beautiful backdrop you’d like your fisherman to be wearing sturdy brogues, thornproof trousers and a Barbour jacket, sipping a good single malt from a hip flask and selecting flies from the band of his tweed hat, a plump Labrador dozing at his feet. Sadly, the real picture is rather different: a middle-aged overweight bloke in a Liverpool bench coat behind the wheel of a six-year-old Renault Mégane listening to the live commentary on Talksport and only taking breaks from smoking and eating to drop litter out the window. We’re not slow to berate our children for spending all day indoors on the X-Box and reminding them that at their age we were playing 30-a-side football matches in the cul-de-sac from dawn to dusk. But adults, too, it seems, increasingly prefer their pastimes to be sedentary – even the outdoor ones. What’s next? Hiking on a quad? Birdwatching from bed? Bog-snorkelling in the bath? Clay pigeon shooting from the conservatory? Maybe if Gerry A shows this to his pal Prince Charles something might get done about it.